Already the eleventh month of the year and the colours of fall continue to change daily. Leaves fall, the winds blow, sometimes gently sometimes stormy. Lovely days, rainy days, and everything in between. Some snow on the mountains on the Halloween weekend but no frost yet down here near the sea. The sun is lower in the sky, the shadows lengthen, the march of the seasons mark the passage of time. The reds against the soft greeny greys are very attractive. 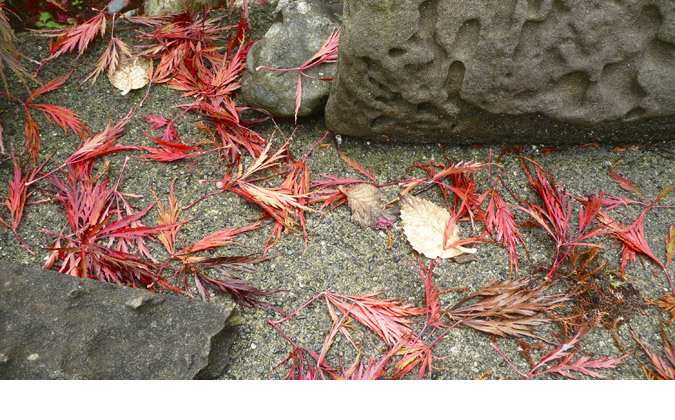 My favorite of these, however, is the last one that shows the amazing range of colors achieved by this dying hydrangea branch. Elegant beyond words, my friend. Susan, I’m pleased that you find these attractive, even elegant, thank you! It’s wonderful to have the colour when there are few flowers left. Beth, these are on our front walkway steps and really caught my eye with their beauty. I’m glad you agree. Thanks for visiting! I think the hydrangeas are at their best just now. Thanks for these rich and warming reds! I’m glad you enjoyed these reds, Lucy! This hydrangea certainly has been lovely, keeping much of is reddish colour for so long. Some of the blues with a hint of pink have gone a dusky maroon, others brown, including the whites. 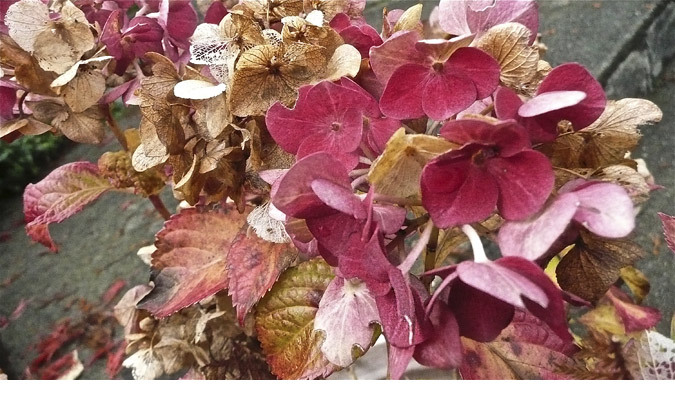 The lacecap hydrangeas did not do well in my garden this year, perhaps due to our severe drought this summer. It is such an odd November here. My hydrangea has the range of reds, pinks, browns, and greens as usual, but also fresh new growth and flowers too! We have so many plants with one or two fresh flowers – it’s mad. 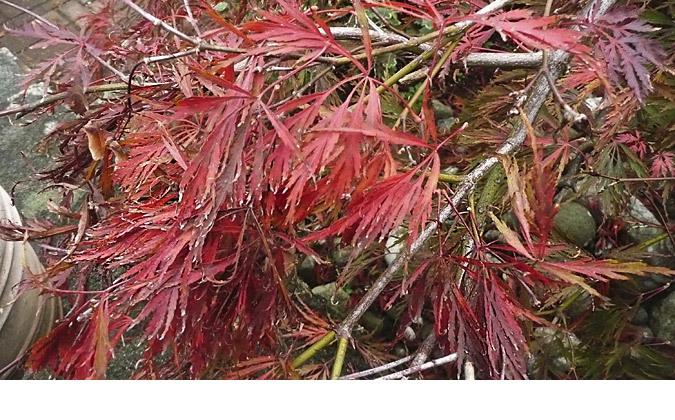 I do love this month, and agree that the red of the acer on grey is splendid. Olga, how unusual indeed, like a second spring! I’m glad you are enjoying this month. November is usually the wettest month of the year here – we shall see. Those reds are lovely. We are mostly gold and amber fading into dull brown here, though there’s plenty of green grass left. Unseasonably warm, though the light is that low slanting light of late fall, and less and less of it each day. Leslee, indeed, over the years I’ve admired your lovely photos of colourful trees in your city. We do have many yellows, golds and oranges as well. 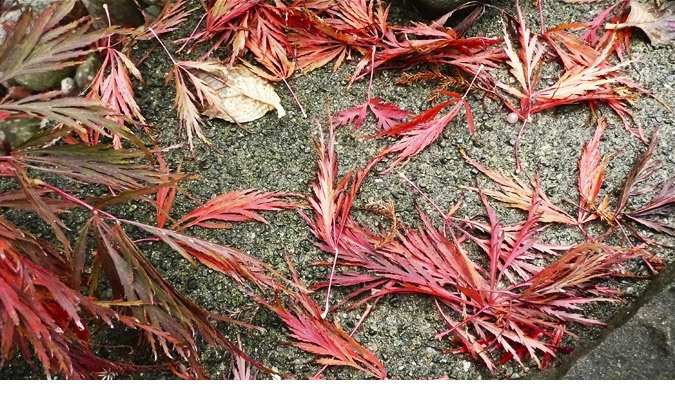 My favourites here just happen to be the Japanese maples in reds and burgundy. It’s almost dark around 5 pm here now, and we find ourselves having dinner earlier than in summertime. Hope your fall season continues lovely! I see so many photos, but yours always have an elusive quality that I can’t pin down. If I start thinking about it, I could say contrast of colors, textures, composition, but that really doesn’t explain the difference from ordinary pictures. Thanks, Hattie, for your thoughtful and kind words! It pleases me that you feel my photos have an elusive quality. Hi, Marja-Leena–just rescued a comment from you, lost in Awaiting Moderation! Yes, am back from Chile and Peru and Mexico after three weeks of rambles. And it was good, very good. Marly, thanks for the Havishamish! Looking forward to reading all about your trip! The electronic barrier has lifted; your stigmata have magically disappeared. But it’s mainly weather here on your blog right back to July and I’ve taken a vow not to comment on that. After all, the UK is world champion with weather: sometimes four seasons in one day. Hello Robbie! I’m happy to see you here though I don’t understand why my blog was incognito for so long for you. I have been a lazy blogger for quite some time so you have not missed much. I won’t compete for championship but it can often be very interesting to observe nature’s many moods especially the storms of which we’ve had several. November is our the wettest month, and it’s not yet over. Hurricanes with power outages due to fallen trees…. thankfully our neighbourhood was not outed despite some flickers. Now we have clear sunny skies, frost overnight, and we can see snow on the mountaintops. Love it! For wild weather, look at what it’s like in Winnipeg and much of Manitoba! Fred and I grew up and married there!